Five years after Boeing said it would offer a new high-speed, mobile communications service for airline passengers, and just one year after that service made its commercial-service debut, Connexion by Boeing is adding to its achievements. On April 27, five years to the day after Boeing announced its new service, the first Boeing airliner equipped with Connexion by Boeing as a factory-installed option left the Boeing factory in Everett, Wash. The airplane, a Boeing 777-300ER (Extended Range) delivered to All Nippon Airways (ANA), was the first such airliner scheduled for delivery this year. Other customer airlines scheduled to receive new Connexion by Boeing–equipped airliners include Japan Airlines, Korean Air and Asiana. Boeing Commercial Airplanes is offering the Connexion option to all 777 and 787 customers. 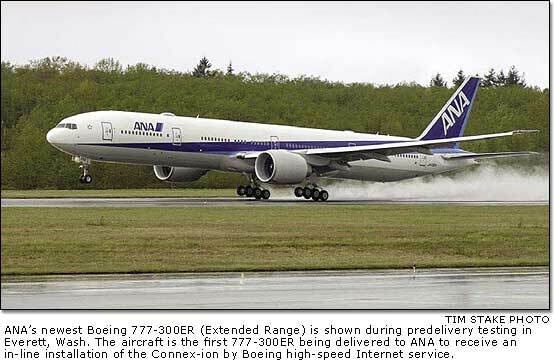 Prior to the delivery of the ANA airplane, Connexion by Boeing system installation had been performed as retrofits to existing Airbus and Boeing airplanes. "Connexion by Boeing customers benefit from being able to take delivery of an aircraft with a high-speed communications system that has been Boeing integrated, certified, tested and made operational at the time of delivery," said Tom Chan, 777 in-line production for Connexion by Boeing. "As we continue to work together and further strengthen our relationship with our colleagues at Commercial Airplanes, both business units will have more opportunities to attract 777 and 787 customers." May 2005 marked the one-year anniversary of Connexion by Boeing's airline debut aboard a Lufthansa German Airlines flight. A year later, transatlantic and Europe-Asia flights equipped with Connexion by Boeing service are increasingly numerous, aboard Lufthansa, Scandinavian Airlines, Japan Airlines, Singapore Airlines and ANA. More than 20,000 passengers have used the Connexion by Boeing service during its first year of availability. As Connexion by Boeing marked its first year of commercial airline service, it also marked another achievement: service agreements with more than 500 corporate customers. One of those corporate customers is The Boeing Company. Boeing employees who travel on company business can, with their manager's approval, sign up for a Connexion by Boeing account and receive a corporate discount. Users may then file the Connexion by Boeing user fees as an authorized expense on their Travel Expense Report upon completion of the trip. For information on how to set up a corporate account with Connexion by Boeing, visit http://network.web.boeing.com/connex/ on the Boeing Web. Just in time for the one-year anniversary, transpacific service began last month. Connexion opened up satellite coverage of the north Pacific Ocean region, allowing JAL and ANA to begin serving the Tokyo-New York route. Earlier in the year, JAL and Singapore began serving routes from Asia into and out of London. Korean Air is preparing to launch transpacific service on routes yet to be specified. China Air, Asiana and El Al Israel Airlines also expect to begin offering Connexion by Boeing as the second year of service progresses. This summer, Connexion by Boeing expects to achieve additional technical milestones. Singapore Airlines plans to introduce real-time television service using the Connexion by Boeing system. This will let SIA passengers watch news, financial information or sports programming as streaming video via their laptops or other computing devices. Connexion also continues to work with Rockwell Collins to develop eXchange, a communications system for business jets. In May, the U.S. Federal Communications Commission issued an experimental license to allow testing of the new system. What's on the horizon for this time next year? By then, Connexion by Boeing hopes to celebrate the anniversaries of signing still more customers, including a launch customer for its global maritime service. It also hopes to offer full global coverage by adding the southern hemisphere to its satellite coverage area. "Our technical achievements in rolling out Connexion by Boeing were not even dreamed of when our plans to offer the service were announced five years ago," said Laurette Koellner, Connexion by Boeing president. "But our creative, dynamic team has accepted every challenge and stayed focused on what our customers want. That focus is what will keep us successful."